In chemistry, there are substances which alter the rate of a reaction without themselves being consumed. These are called catalyst; the function of such a substance was to loosen the bonds which hold the atoms in the reacting molecules together. Hence, it is called catalysis. Heterogeneous catalysis is a process where catalyst employed in a reaction is in a different physical phase from the reactants . Catalysts are very important in the chemical industry, where they are used, can increase the efficiency of a chemical process and decrease the overall cost to the manufacturer. Devoting more time and resources to the discovery of new and better catalysts may not be surprising. Despite this, the mechanisms of many catalyzed reactions are not well understood, and many of the catalysts used in the chemical industry were discovered by trial and error rather than by fundamental research . In Nigeria, many industries use catalysts for their chemical process. These catalysts are all imported at considerable foreign exchange costs there is a need to source the catalysts locally using local expertise and raw materials. The country has deposits of clays and sands that can be used as essential mineral species for catalysts development. Kaolin is cheap and abundant clay found in many parts of Africa and Nigeria that can be used for catalyst development . Crotalaria pallida Aiton plant was collected around the roadsides of Federal Teaching Hospital and Federal Low-Cost Housing Estate in Gombe, Gombe State. The plant was identified by the Biological Science Department of Gombe State University. The root, stem, and leaves of the plant were ashed separately and were used separately to carry out the catalytic reaction on kaolin support that was obtained along Bauchi road. Waste cooking oil was also obtained from local women in Gombe State that were used for transesterification . Wet impregnation method was adopted to prepare the catalysts , thus: Certain amount of kaolin was added separately over different portions of the ash. The catalysts were allowed to dried and later calcinated at a certain temperature for 5 h in air. 10.2 ml of the stock solution of kaolin was added slowly into newly dried 10 g of ash and was constantly stirred until a homogeneous mixture was obtained. The water was removed by heating the sample on a mantle. The powder so obtained was calcinated at 500ºC for 5 hours. A, B, C, and D denotes the catalysts loaded with 5, 10, 15 and 20 wt.% kaolin respectively. The effect of kaolin loading over the catalysts’ structures and catalytic effect were determined by characterization. Stability and reusability test: The re-use of the prepared catalyst was determined in the production of biodiesel from waste oil to assess the stability of the ash based catalyst. The reaction is carried out at the speed of 500 rpm at 160ºC. The procedure was repeated three times. Filtration method was used to recover the catalysts before re-use after every circle. The catalyst employed for the first batch reaction was said to be 100% relatively active. 1, 2 and 3 denote catalytic runs while the values of oil conversion were defined in percentage. The values obtained were compared with the standard ASTM D6751 . The metal oxide composition and structure of the ash/kaolin catalyst were determined using X-ray Diffractometer and Scanning Electron Microscope before its use; the material was grounded to a fine powder . Scanning electron microscope (SEM): Immediately after manufacturing, then catalyst implants and blank were subjected to surface morphology studies using SEM. They were first dried, glued to aluminum sample holders and coated with gold under argon atmosphere. SEM (JSM 848, Joel, Japan) was used to analyze the samples under appropriate magnifications . XRD analysis: Bruker AXS D8 Advance diffractometer was used to investigate the diffraction patterns of the pure catalyst and loaded PCL implants. 0 to 60 was defined to be the range of the scan while 2 was the speed of scan per minute at an increase of 0.02 . XRF analysis: The sample was prepared as a flat disc, with the diameter of 20-50 mm and was grounded to a fine powder. The samples were analyzed by adopting the method proposed . The figures below represented the XRD patterns, XRF mineral composition and SEM of the prepared catalysts as A, B, C, and D.
Catalyst stability and reusability test were also carried out as shown in FIG. 1 where FIG. 1-3 stands for the number of runs while the waste cooking oil conversion values of 87.5%, 75.5%, and 51.5% were observed respectively for the leaf sample compared to that of the root and stem sample. The waste cooking oil conversion values decreased slowly from 87.5% to 51.5% when the process was repeated 1-3 times. On the other hand, a significant loss of catalytic performance was observed in the 3rd run, which indicated a significant reduction of the number of catalyst’s active sites after numerous washing and purification processes . The two possible reasons behind catalyst deactivation are surface poisoning and structural collapse . The surface poisoning might be due to the surface-bound glycerides that are triglycerides (TG), diglycerides (DG) and monoglycerides (MG) on the catalyst, which cannot be removed with the less polar solvent . Therefore, the results of reusability and regeneration studies definitely indicated that the kaolin/ash catalyst is very stable and durable during the transesterification reaction, which is better than that reported . The percentage ash content for leave, root and stem sample are 30.33%, 27.66%, and 29.69% respectively. The kinematic viscosity at 400◦C and acid value (mg KOH/g) for the waste cooking oil is 55 mm2/s and 3.37. Figure 1: Stability and reusability test on biodiesel yield (%) at 160°C for 24 hours. Figure 2: XRD of (A) 5% wt, (B) 10% wt, (C) 15% wt and (D) 20% wt Kaolin/ash based catalysts from the leave sample. 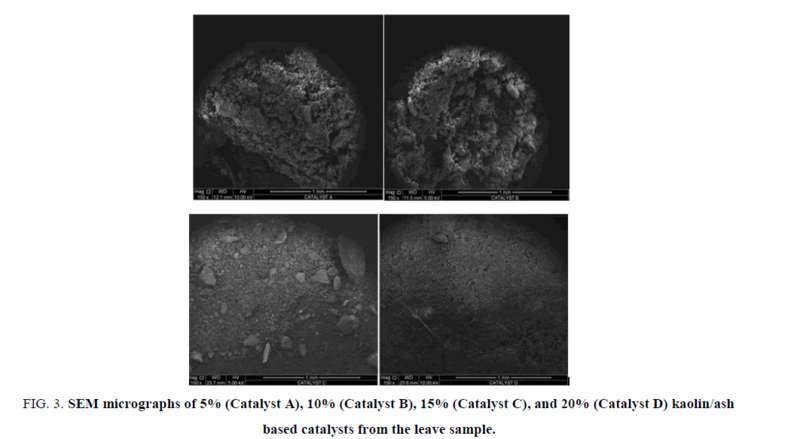 Figure 3: SEM micrographs of 5% (Catalyst A), 10% (Catalyst B), 15% (Catalyst C), and 20% (Catalyst D) kaolin/ash based catalysts from the leave sample. FIG. 2 depicted the XRD patterns of 5% wt., 10% wt., 15% wt. and 20% wt. prepared from kaolin/ash based catalyst in this study. The XRD results of the leave sample are represented as A, B, C and D. It can be seen that the catalysts A, B and D remained were not changed, this indicates that their crystalline structure remained intact. Conversely, the XRD pattern of catalyst C has significantly changed, that is, a shift has occurs with regard to the peaks intensities as depicted in FIG. 2below. X-ray shielding caused by absorption of carbonaceous material during the reaction may have caused the shifting of the peaks. Breck DW, et al. and Adebajo MO, et al., [11,12] reported a similar observation in their different researches on the hydration of zeolite and methylation of naphthalene by methane. XRF data revealed the compositions of the synthesized materials from kaolin/ash catalyst from the leave sample. TABLES 1 and 2 present the compositional values obtained from the XRF analysis of the prepared kaolin/ash based catalyst from the leave sample. The characterization results revealed high CaO, SiO2, K2O, MgO, Al2O3, TiO2 content in the synthesized materials. However, when the kaolin increased in concentration, Al2O3, TiO2, and SiO2 also increased while CaO and K2O decreased. This trend may be associated with the increase in the yield of biodiesel . Table 1: Chemical composition of kaolin/ash based catalyst. Table 2: Corresponding oxide composition in Alkaleri Kaolin. Morphology: The particle size and shape of the leave samples were investigated using SEM, and the images are shown in FIG. 3. The catalyst A, B, C, and D observed to have a definite morphology with a crystal structure (aligning with XRD pattern obtained), and the size of the crystalline was measured to be 1mm with a uniform distribution. It can be observed that there was a good dispersion from all the images from the leave samples. A closely and neatly packed spherical granule was found in catalyst C, whereas catalyst A and B showed a large size distribution of particles similar to the structure of calcium oxide. Catalyst A and B formed a group of non-uniform crystalline particles. It has been observed that an increase in the catalyst loading caused a substantial decrease in the particle size, which may obviously account for the combined nature of the crystalline. This combined crystalline nature of the kaolin/ash based catalyst was in concordance with that of CeO2-CaO nanocomposite oxide reported by Taufiq-Yap et al., . Because of the good dispersion of the ash over the surface and into the pore of kaolin, various macropores were observed to be present over the particles’ surface. Therefore, the porosity of decreased with decrease in ash content. Catalyst D has been observed to show a uniform combination of smaller particles, which may increase the efficacy of the catalyst. From the image, it can be observed that catalysts displayed a uniform pore size which a pore structures that are highly-arranged and characteristic orderliness. Heterogeneous catalysis is one of the powerful and fundamental techniques for in the production of biodiesel. Kaolin has been impregnated by ash to produce this type of heterogeneous catalyst. The choice of the impregnated and impregnating materials was based on their availability, non-toxicity, and cheapness. The results of reusability and regeneration studies indicated that the kaolin/ash catalyst is very stable and durable during the reaction. However, both SEM and XRD confirmed the chemical and crystalline structure of the developed kaolin/ash based catalyst while XRF measurements revealed the compositional data of the prepared catalyst. Bahl BS, Bahl A, Tuli GD. Essentials of Physical Chemistry, New Delhi: S. Chand and Company Ltd. 2000:706. Avery HE. Basic Reaction Kinetics and Mechanisms. Hong Kong: The Macmillan Press LTD. 1982:113. Obiora O, Akofe OAA. Catalyst Application in Nigeria and Prospects for Local Sourcing. Conference Proceedings On: Chemical Engineering and Vision. Port-Harcourt. 2010:110. Buhari IM, Danbature WL, Muzakir MM et al. Production of Biodiesel from Baobab Seed Oil, Greener. Journal of Agricultural Sciences 2014;4:022-6. Omotola B, Leslie P, Nicholas M, et al. Use of Coal Fly Ash as a Catalyst in the Production of Biodiesel. Petroleum & Coal. 2010;52:261-72. Susan S. Scanning Electron Microscopy: A Review. 2016;12:43-47. Suryadi I, Felycia ES, Stevie H, et al. Bentonite and its Modified Forms as Solid Catalyst for Biodiesel Production. The 13th Asia Pacific Confederation of Chemical Engineering Congress, Indonesia. 2010:1-6. Yap TYH, Siow HT, Umer R. Heterogeneous Catalysis of Transesterification of Jatropha curcas Oil over Calcium?cerium BimetallicOxide Catalyst. The Royal Society of Chemistry. 2014;4: 48836-47. Thitsartarn W, Kawi S. An active and stable CaO-CeO2 catalyst for transesterification of oil to biodieselS. Green Chem. 2011;13:3423. Breck DW, Eversole WG, Milton RM, et al. Crystalline Zeolites. I. The Properties of a New Synthetic Zeolite, Type A. J Am. 1956;78:5963-72. Adebajo MO, Long MA, Frost RL. Spectroscopic and XRD characterisation of zeolite catalysts active for the oxidative methylation of benzene with methane. Spectrochimica Acta Part A: Molecular and Biomolecular Spectroscopy. 2004;60:791-9. Chiroma TM, Tsware BJ, Mujtaba IM. Transesterification of Jatropha curcas L. seed oil to biodiesel: An update. International Journal of Current Research. 2016;8:25140-60.